I think I did, at one point, mention that I’m trying to streamline my lunch. I tend to want to think – Bing – “I want lunch!” and then go eat lunch… and in summer, with the prepared salad fixings, I’m not far off that. In winter, though… I have a way to go. 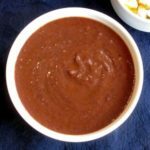 This post isn’t really a recipe, as such, but a list of suggestions. 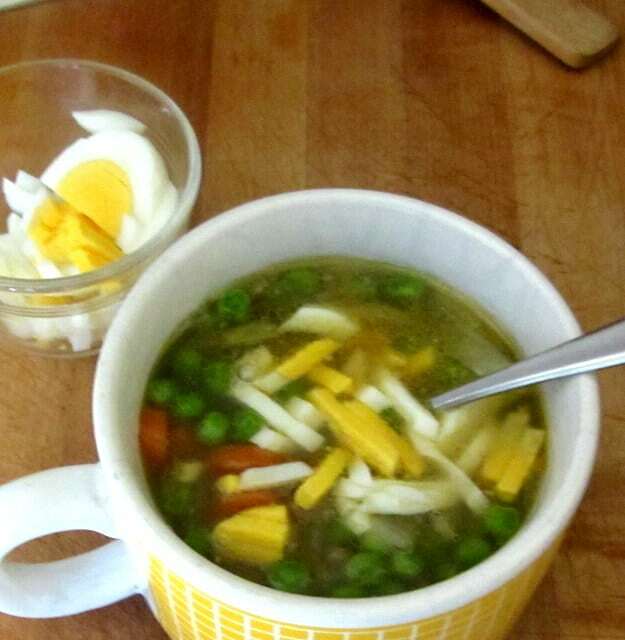 It started when I was writing a WIAW post a couple of weeks ago, and started to write about making my soup – and realized I had enough information to make it a whole post by itself. 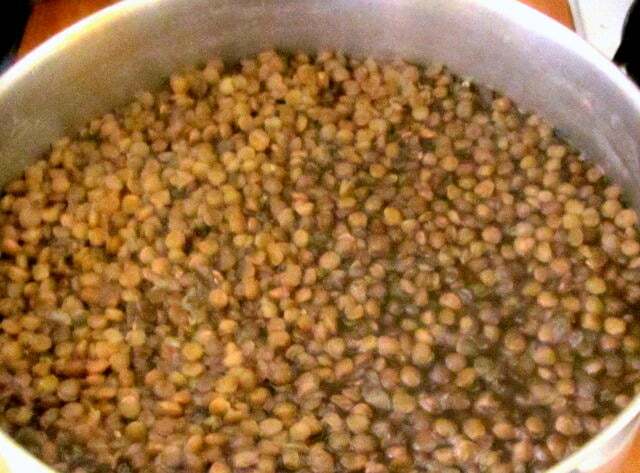 I’m going to walk you through a few of the things I did with one pot of lentils. The thing is, lentil soup is incredibly versatile. Odds and ends of any meat taste good in it, rich pork or delicate chicken, and it is delicious as a vegetarian soup. All kinds of vegetables work well. This makes it a fantastic haven for leftovers. You can use curry spices to give it an Indian flavor, or garlic, parsley and lemon for Greek, or cumin and a splash of vinegar, or German sausage. So, on the one day, about an hour before I usually eat lunch, I thought “I wonder what I’m fixing for lunch? I should do something about that!” (Yes, it would be nice if I were more organized about it than that… I’m working on it…) I went in the kitchen – and poured lentils and water into my soup pot, and set it to boil. (Three cups of lentils to three quarts of water seems to fit well in my soup pot.) When it came to a boil, I lowered the light, and set the timer for 45 minutes. Then I went back to the work I was doing. When the timer went off, I had a nice big pot of lentils. I also wanted to eat pretty soon… so I didn’t fool around with anything else that needed real cooking. I put some lentils, and all the liquid in the pot, into a saucepan. (If I’d done this in time for them to cool, I could have just packaged most of the cooked lentils, and then made my soup in the same pot. I didn’t want to put the hot lentils away yet, though.) I still had some frozen cooked onion, a little bit of slow cooked pork, and a frozen greens muffin. 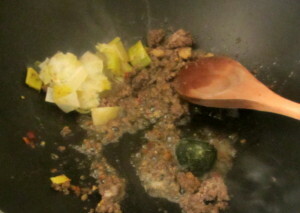 I chopped all that up, threw them in the pot, added a touch of salt, let it simmer a minute or two, and served. The next day, I was in less rush. 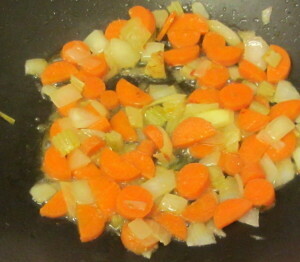 I chopped half an onion and a carrot, sauteed them with a little chili garlic paste, and some cumin. When the onion was soft and starting to brown, I added another chopped greens muffin, lentils, and water. Even though I just used water, not broth and no meat, the seasoning was enough to make the vegetarian version taste rich. I added just a touch of wine vinegar to each bowl as I served it, for even more flavor. A couple of days later (we didn’t really eat lentil soup *every* day that week) I just lightly sauteed an onion with a carrot, and added the last of the celery I sauteed and froze last Fall, to make a mirepoix. 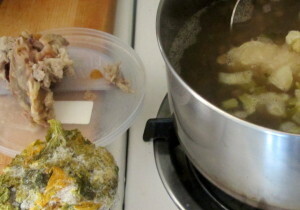 I added lentils and, this time, a few cubes of the pork broth I’d frozen, and water. Then I tossed in some frozen peas. When I served, I sliced a hardboiled egg for garnish. At this time of year, I’m deliberately finishing up the vegetables I froze 4-6 months ago. 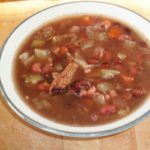 So, the next day, some frozen leeks, and frozen thyme, and a little frozen cooked ground meat (that, I just cooked a couple of weeks ago) for my base – and then lentils, a few cubes of stock and some water, and another good soup. That is four different pots of lentil soup, all from one big pot of lentils. Sometimes we just ate the soup, with muffins or rice cakes, sometimes I served cheese or hummus on the side, with a smaller amount of soup. Another time I might simmer a single small chicken thigh in the lentils until cooked and then shred the meat (or, of course, just add leftover cooked chicken,) or brown a sausage cut in coins, or add tomatoes and basil and sprinkle with parmigiano cheese, or saute onion with curry powder and cabbage before adding the lentils, or crumble in feta cheese… Usually there is some similarity in the ones I make in a given week, just because I have the same ingredients on hand (you notice carrots were popular this week…) Usually I make just enough soup for one meal, but sometimes I go ahead and make extra so that I have a quart of completely cooked soup on hand, for days when I need something even more quickly. 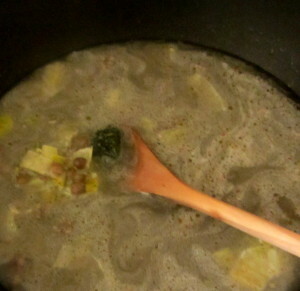 (And of course – whenever it makes sense, you can go right ahead and make the full soup pot of any one variation. I certainly still do that, too.) If I were packing a lunch for someone else, I would probably make enough for my own lunch, and enough more to pack for the next day. What did I not think of? 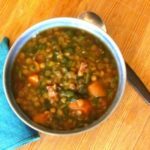 I’d love to hear other ideas for a basic lentil soup… And I’ll point out – you can really do this with other beans, too. 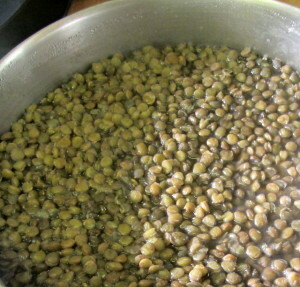 I usually use the lentils because we buy ten pounds at a time (in turn, because we do use them…) White beans would certainly be just as versatile… or split peas. 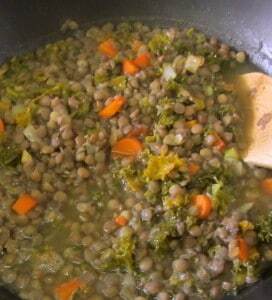 Let me go now to put on another pot of lentils for this week… it makes a good lunch so much simpler.